There are a lot of ways to preserve summer herbs into the fall and winter – chop and freeze, air dry, an oil infusion – but I decided to try a more short-term option I’d never tried before, herb butter. Combined with some fresh, warm bread (or maybe on a steak), you just can’t go wrong with freshness. I picked three herbs for each butter, based on what was growing in the garden and what I thought I’d enjoy. Sage, rosemary and thyme for one and parsley, chives and jalapenos for the other. Okay, so jalapenos aren’t technically an herb, but I was getting guacamole inspired. The only real rule I followed is an approximate 2:1 ratio – so I combined 1/2 cup butter (1 stick) with about 1/4 cup of finely chopped herbs. You could always increase or decrease the herbs based on your tastes, of course. The butter should be room temperature or a little warmer (just sit it near the stove for a bit), and you just stir in the chopped herbs with a spoon and enjoy. 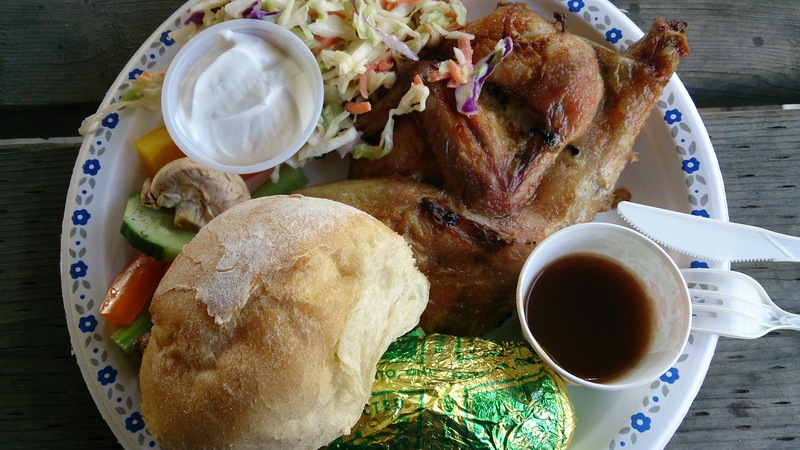 The Poplar Hill Lions put on a delicious chicken dinner at the annual Poplar Hill Picnic in June. Like the Ilderton Fair in the fall, the annual Poplar Hill Picnic in the summer is an annual tradition for my husband and me. It’s a wonderful, small-town gathering that includes potato sack races, a lip sync contest, crafts for kids, a cute baby contest, a chicken dinner to die for and more! While I have no little people to enter into the races and contests, watching the unbridled joy as kids run and tumble through the races or put their whole heart into a lip sync routine they’ve obviously been practicing for months, is an absolute joy. Our dog Dallas usually accompanies us for at least part of the day, (the park where it’s held is just a few minutes’ walk from our house), and he’s always a big hit with the kids, though I know all he’s thinking about is how to steal a hot dog. So if you’re ever wondering what to do on a quiet Saturday in the middle of June, head out to our little hamlet northwest of London, you won’t regret it. For Mother’s Day this year, we agreed to do a potluck, bringing everything to mom and dad’s place, but saving mom from having lots of dirty pots and pans. 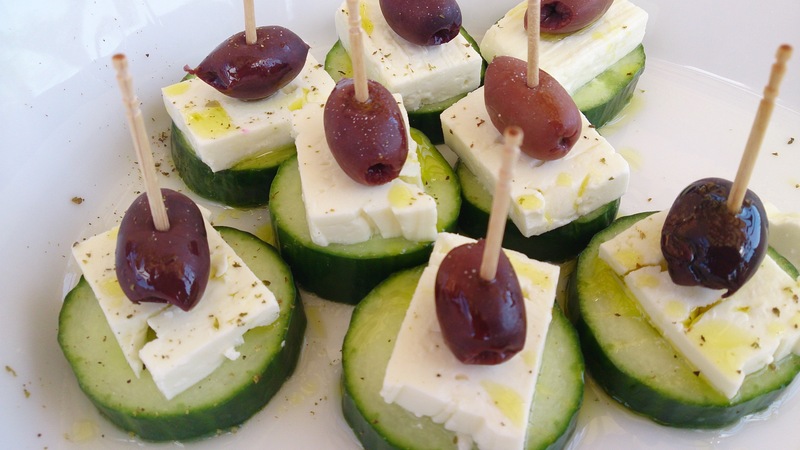 I was on appetizer duty, and I decided I wanted to try out some one-bite appetizers, like the kind you’d find on platters at a fancy party. 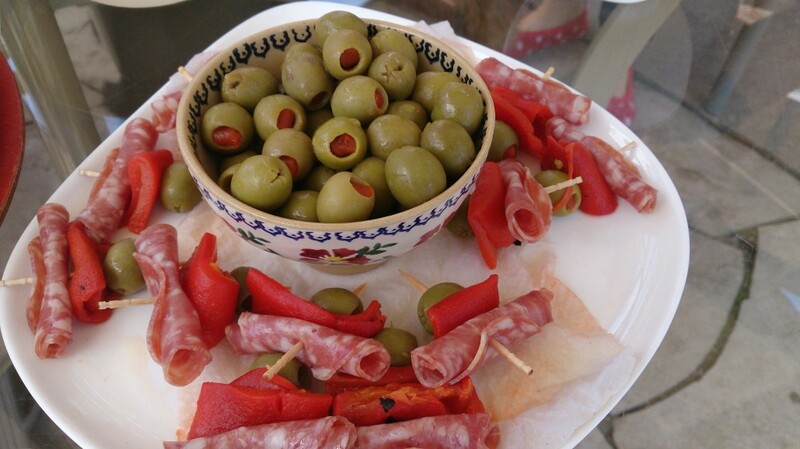 I’d had some good success with some Caprese Salad skewers (cherry tomatoes, bocconcini and basil), so I thought I’d try some variations on that theme, including Greek Salad (cucumber, feta and kalamata olives), Roasted Pepper with Salami and the classic Prosciutto and Melon. 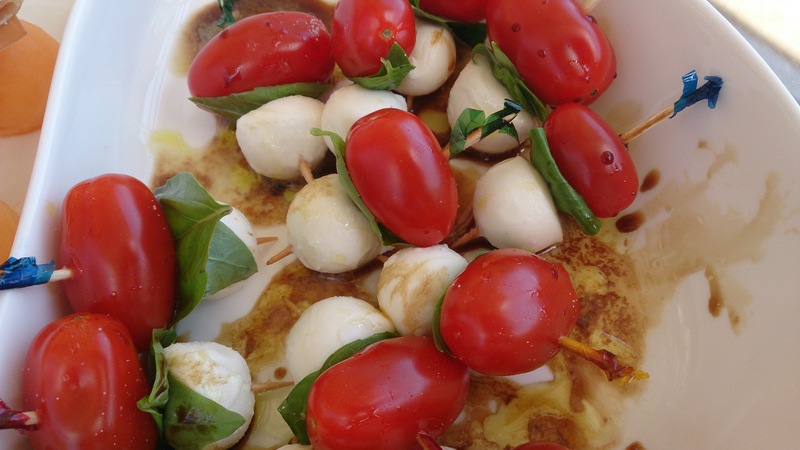 What you see is what’s in these, but the two salad skewers got some olive oil and salt, and the Caprese got some Balsamic Vinegar too. While the short ingredient list makes them easy, I have to admit they’re pretty time consuming, and cherry tomatoes do not go gently onto toothpicks. The other concern is when combining fruits or veggies with cold cuts. 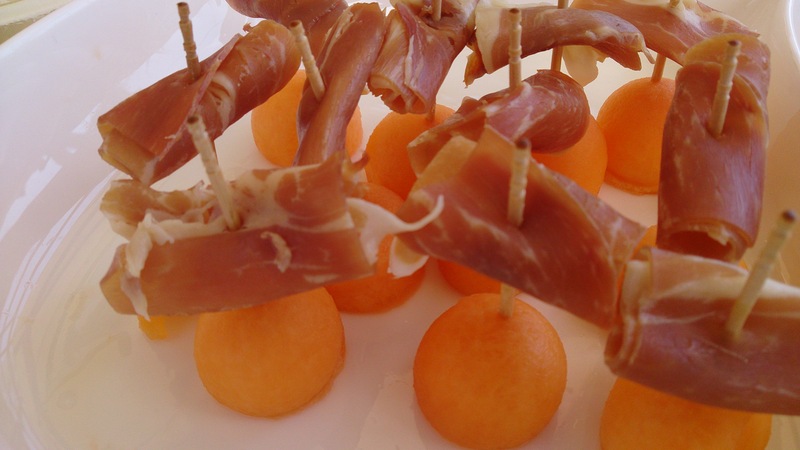 You want to make sure that you are either making them just before serving, or leave a little space so, for example, the melon doesn’t wilt the proscuitto. Final verdict – despite taking some time, these were a big hit, and I think you could take any classic appetizer and use the same trick, as long as you’re willing to put in the time. 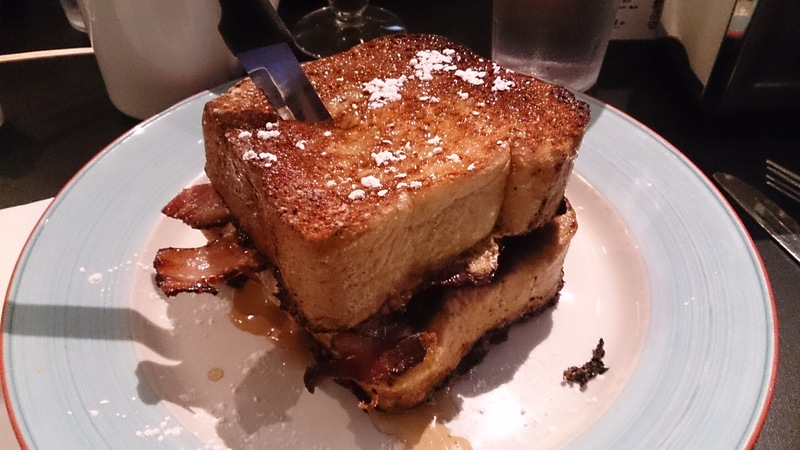 ‘The Fat Elvis’ at The Early Bird in London, Ont. If you’re in the mood for some classic diner fare with a twist, you might want to give The Early Bird, on Talbot Street just south of Budweiser Gardens, a try. While the restaurant is reminiscent of the 50s diner, it’s all modern hipster, with great graphics and fun art covering the walls of the tiny place. Oh, and the food’s great too. Everyone in our party of four loved their meals, with the kind of exclamations that make you blush just a little. My meal was ‘The Fat Elvis,’ a French toast sandwich with house smoked bacon, honey, peanut butter and fried bananas all topped with maple syrup. Yum. If you don’t believe me, you can always watch their segment on Food Network Canada’s You Gotta Eat Here! 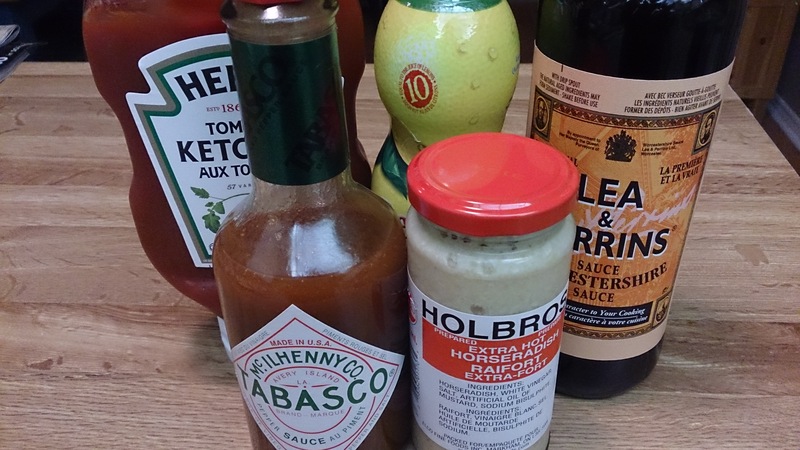 The main ingredients in almost any cocktail sauce are: ketchup, hot sauce, lemon juice, horseradish and worcestershire sauce. 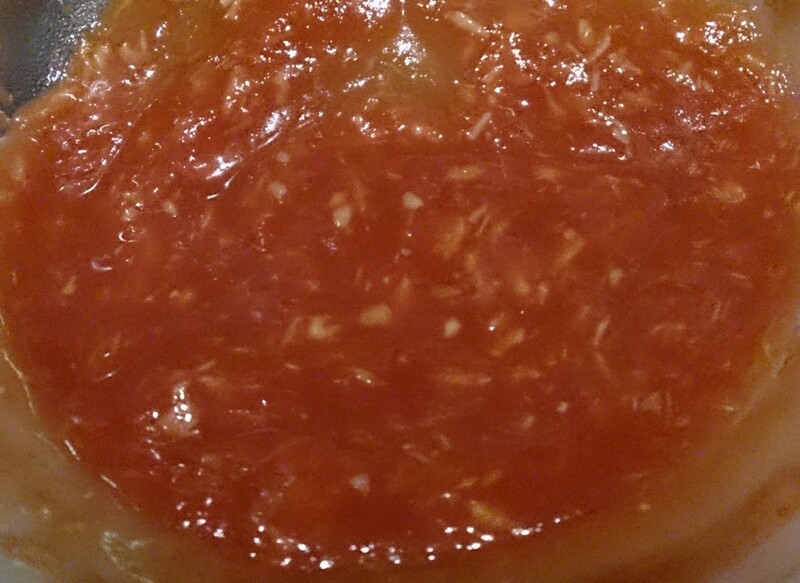 I wish I had known years ago how easy it was to make cocktail sauce (aka seafood sauce). With just a handful of ingredients, all of which live in most people’s fridge and pantry, you can make your own and customize it to boot. Like it spicy? Add another spoonful of horseradish. Not big on sweetness? Dial back the ketchup. There a tons of recipes out there, I just picked one that I had all the ingredients for, but you shouldn’t be afraid to substitute. Pick any hot sauce, use lime juice instead – just have fun. 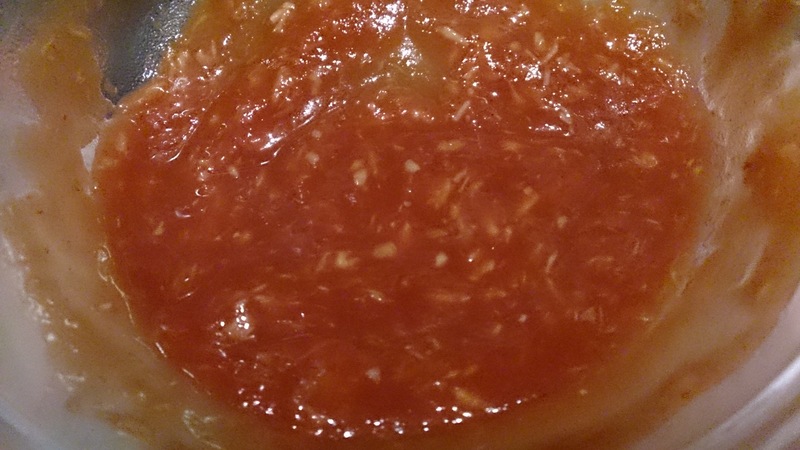 Homemade cocktail sauce looks just like what you get at the store.